Why is the brain divided? The difference between right and left hemispheres has been puzzled over for centuries. 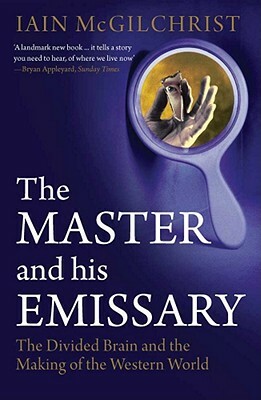 In a book of unprecedented scope, Iain McGilchrist draws on a vast body of recent brain research, illustrated with case histories, to reveal that the difference is profound not just this or that function, but two whole, coherent, but incompatible ways of experiencing the world. The left hemisphere is detail oriented, prefers mechanisms to living things, and is inclined to self-interest, where the right hemisphere has greater breadth, flexibility, and generosity. This division helps explain the origins of music and language, and casts new light on the history of philosophy, as well as on some mental illnesses. In the second part of the book, McGilchrist takes the reader on a journey through the history of Western culture, illustrating the tension between these two worlds as revealed in the thought and belief of thinkers and artists, from Aeschylus to Magritte. He argues that, despite its inferior grasp of reality, the left hemisphere is increasingly taking precedence in the modern world, with potentially disastrous consequences. This is truly a tour de force that should excite interest in a wide readership. Iain McGilchrist is a former Fellow of All Souls College, Oxford, where he taught literature before training in medicine. He was Consultant Psychiatrist and Clinical Director at the Bethlem Royal and Maudsley Hospital, London, and has researched in neuroimaging at Johns Hopkins University, Baltimore. He now works privately in London and otherwise lives on the Isle of Skye.